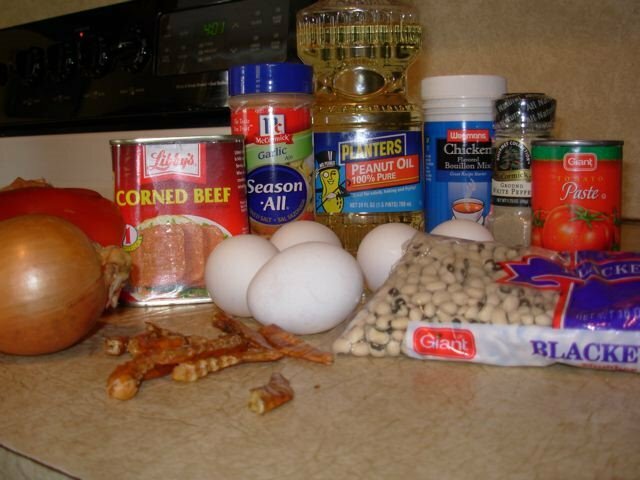 I found this picture on Google which pretty much sums up the cupboard of a Nigerian cook (in this case the ingredients for moin moin or bean cake). A few items are missing though, such as Maggi and curry powder but it’s close! The thing about us Nigerian daughters, is that we know at any point we will be called upon to come and cook. I say cook loosely, what I mean is what is commonly refered to in western society as catering. Unpaid and with little thanks we will be asked to produce one or two national delicacies for a ‘small’ gathering of up to 50 people. We have grown up with this expectation; we were in the kitchen with our mothers developing our catering skills from the age of 7 or 8 when our job would be to cut the onions or open the tins of tomato. Well I am no longer the child helper, these days I am called upon to produce my own dishes and I always relish it. Most people who know me know I love cooking, and doing my best to reproduce Nigerian cooking is a hobby of mine. I rarely have the time for my favourite dishes which take days and patience to produce, but I will jump at the chance to produce things like jollof rice, fried rice, spinach, gizard, egussi and yam porridge. So when my Aunt had a beautiful bouncing boy, I knew that on the 8th day I would be called on to help cook for his naming ceremony. So I rolled up my sleeves and on the appointed day I dug out my mother’s biggest pot (which needs two burners on the cooker) and hoped that I could scale up my fried rice for 4 to fried rice for plenty! I also tried out my aunt’s recepie for gizzard and plantain in tomato sauce which came out quite well if I say so myself! What always amazes me however, is the audacity of the Nigerian guest who feels that it is their right to attend any function and be treated like royalty. I was very near to going ‘south-london’ on one particulear aunty (sure as hell was no relation of mine) whilst serving the food at the naming ceremony. My sister and I had set up a very organised production line to make sure everyone got appropriate amounts of food (not wasteful amounts) when this so called aunty pushed in and insisted that someone had hidden some fried rice and that we were being stingy with the portions. She also ignored the paper plates and went for proper plates claiming she needed to serve some ‘special’ guests…she was nowhere to be seen when time came to wash up! This is the curse of the Nigerian daughter at such functions; having to deal with these women who make it their business to get the most rice and meat, who are highly likely to find a piece of tupperware and take some ‘takeaway’ before the majority of guests have been served, who happily hoard bottles of Malta Guiness under their chairs and are often seen complaining that they didn’t get something from someone who should have known better. All this while doing their best to be the perpetual guest and never the helpful daughter. Still, I live on. The food was a success, everyone got fed apart from the uncle who asked for pounded yam….sorry love, these daughters were brought up in England….we don’t pound anything! My nephew was named; welcome to the world Samuel Adeolu Ifeoluwa Afolabi Johnson-Oreoluwa (trust me I’ve even forgoten some of his names!) and I live to cater for another day having beat my pb (olympic terminology there 😉 in terms of servings per pot!